"Monsters, explosions, senseless destruction. You've seen the movies, you know what to do." battalion was a game written in 1994 on my Silicon Graphics Indy in GL for the IndiZone 3 contest as a way for me to unwind after completing my PhD. This version also ran in the CAVE(tm) as a virtual reality game and was first publically shown at the EVE 4 art show in May 1995. The GL version won 'best indy software' at IndiZone 3 and was made available on the Indizone3 CDROM. I converted battalion to OpenGL (with several enhancements) and modified it to work with the MESA graphics library in late 1996. In 1997 it won the Hot Mix 17 game contest from SGI, and was available on the Hot Mix 17 CDROM. In 1999 I upgraded the CAVE version to OpenGL so it would run on SGI, Linux, and HP powered CAVES and ImmersaDesks. The desktop version was ported to a variety of platforms by myself and others: Suns under SunOS 4 and Solaris 2, under Linux, on HP workstations, under AIX, under OpenVMS, on the Macintosh, on Windows 95 and the BeOS. My latest enhancements to the desktop versions were the classic and carbon macintosh versions, and a Windows 95/NT/98/xp version. After a few years hiatus I have come back to my original code and decided to port it to the iPhone ... which has about the equivalent OpenGL graphics power to my SGI indy from 1995. 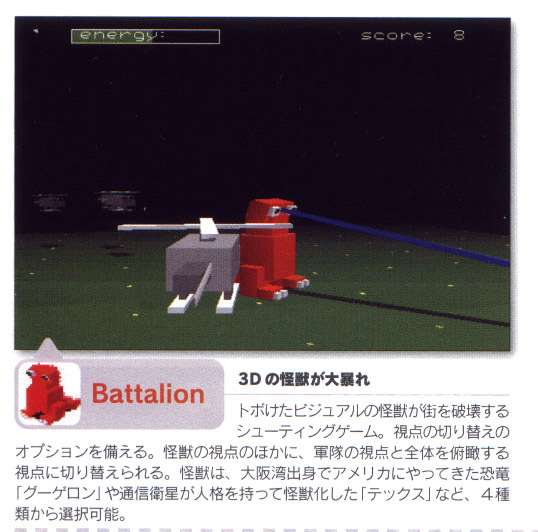 Here is the description of battalion from the Silicon Graphics homepage in Japan. 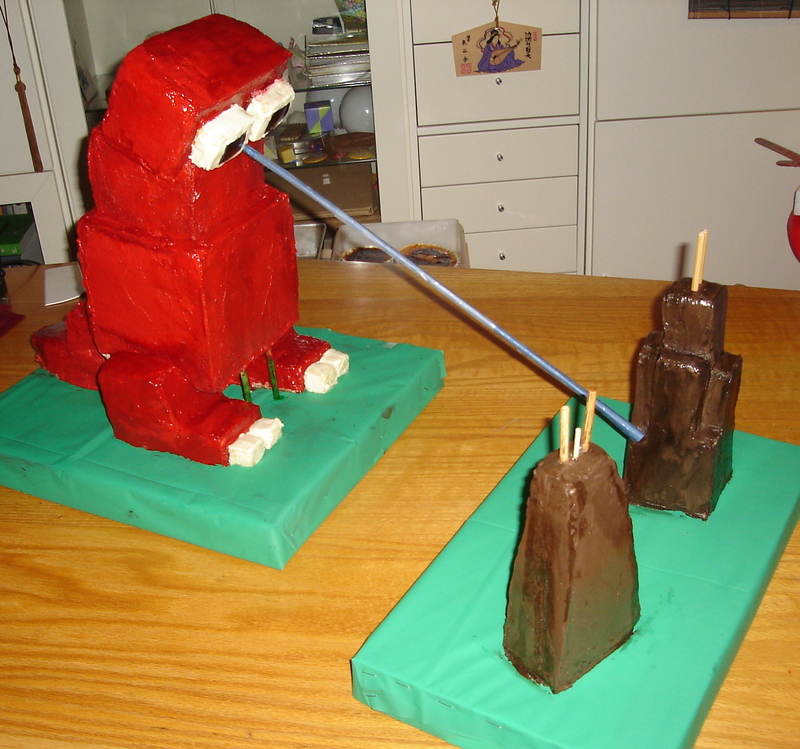 Here is a battalion themed cake from 2005, made by Chris Vasilakis. yummy. Voglio giocare! / Zelim se igrati / Quiero jugar! Here are the various versions of battalion that you can download. Many of these were compiled several years ago so I'm not sure what will happen if you try to run them, or even if they will still run. As of 2009 the only currently supported version of the game is on the iPhone and iPad, though I fixed the linux version in the summer of 2010 so that should still run. This software is provided 'as is' without any warrenty whatsoever. Googelon. Flutter, Techs, the Vapour, and I disclaim any bad things that may happen to you, your loved ones, your co-workers, your pets, your social life, or your electronic equipment as the result of downloading and playing this game ... so if you go on a shooting rampage at a fast-food restaurant please don't blame me. For many years I have wanted to make a strategy game where you would play the army and deploy forces and allocate resources to combat the attacking giant monsters. When the indizone contest came along it was obvious that such a game was not appropriate but that an arcade version of the concept would work. A major inspiration for the look of the game came while I was watching my Japanese laserdisc of 'Radon' (This version lacks the unending naration of the American version, and all of the people in Japan do not sound like either George Takei or Keye Luke.) While watching the battle between the Radons and the army in Sasebo I started making some drawings and that led to the game. The idea of playing the army quickly faded as it would have been extremely difficult to control all of the various units involved, so the player was soon playing the monster. And after all, you always did want to be the monster when you were a kid. When I decided to make the game look like the kind of battle children would have with plastic monsters on a model railroad the style of the game all fell into place. I also wanted to make the kind of game that Calvin (from Calvin and Hobbes) would love to play ... though he would probably also want to be able to crush the fleeing citizens. The one other requirement for the game was that I wanted to have what I dubbed the 'MechaGodzilla firestorm' from the two 1970's MechaGodzilla movies, where there were pyrotechnics and coloured rays shooting all over the place. MechaGoogelon originally was to play that role, but I thought adding a hero (a non-denominational Ultraman, UltraSeven, Mirror-Man, pick your favorite) was better suited that purpose ... and its just fun to fight the hero. CC&C was a strategy game where you played a movie monster in a major city, eating people, fighting the national guard, trying to avoid stepping on power plants, and keeping a sharp eye out for the mad scientist in his helicopter. Sabotage was the original(?) 'lone gun emplacement beseiged by paratroopers' game which has since been reincarnated many times on many different platforms. 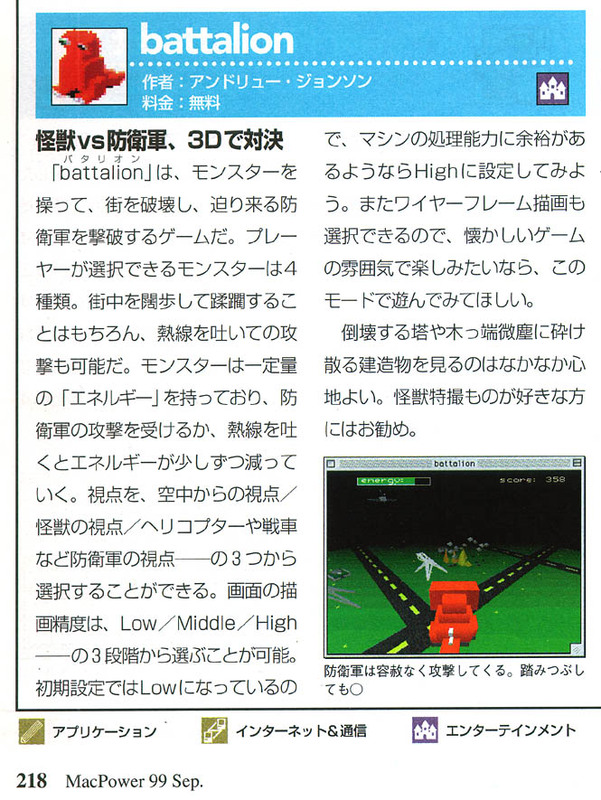 The OS-X version of battalion got a colour 1/4 page mention in the November 2001 issue of MacPower magazine in Japan and appears on the CDROM in that issue. Thanks to the MacPower people for sending me a copy of the issue. Scans of that page are here and here. The Macintosh version is currently also available on apple's OS-X software site (www.apple.com/downloads/macosx/) in the Games and Hobbies section. 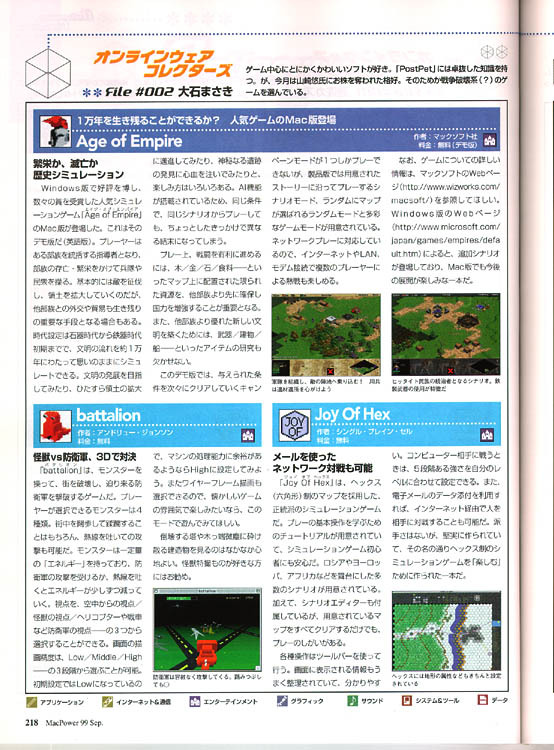 battalion got a 1/4 page mention in the September issue of MacPower magazine in Japan. Scans of the page are located here and here. battalion won the Creator Program games contest from Silicon Graphics, and is now included on the HotMix 17 CDROM from SGI. I want to thank the members of the Electronic Visualization Lab for all their helpful suggestions during the development of this game (though almost all of the suggestions were 'give us more stuff to blow up'). I also want to thank Ray Harreyhausen, Eiji Tsubaraya, and all the others who perform magic with pieces of rubber and plastic.